This lesson plan was designed to show an example for how to teach ABC Order to children who are blind. My daughter, Madilyn, learned to sing the alphabet when she was about 4 years old. It’s the same time children without developmental delays are expected to start reciting them. I contribute the achievement of this single milestone (Yay! We could actually check one off the list!) in part to the countless days that were filled with LeapFrog DVDs on “repeat” morning, noon, and night. 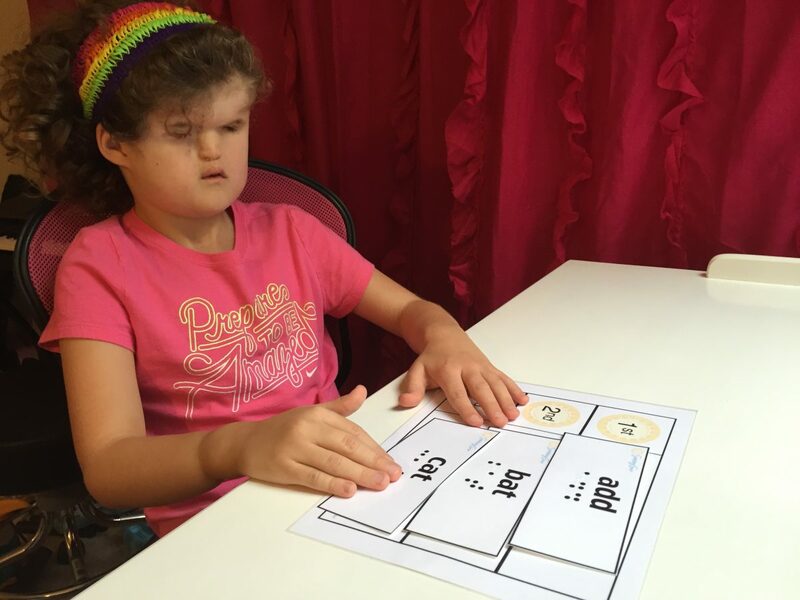 But even though she loved the ABC’s, talking, and language in general, she had no interest in reading Braille books or labels, nor anything else that didn’t make sounds. Now that she is 10 years old, we are trying to play catch-up in the general education curriculum areas. Math is coming in at the back of the progress sheet. Addition and subtraction are tough concepts for her to truly comprehend for long term memory. However, language arts and reading have picked up and we’re starting to see some real progress! We took the summer to really focus on getting organized for the upcoming school year and assessing her comprehension level in each subject. When given material auditorily, she can learn on a third grade level in language arts areas like grammar, spelling and structure. Then, when it’s time to read independently, this slows her down to about a K-1st grade level. To make the most of her learning abilities without giving up on the parts that are a struggle, we adapt longer reading materials with audio. We are keeping her reading braille to short sentences, vocabulary words, and similar activities. Sequencing has been a topic that just seems to click for her when it comes to language. We are taking advantage of her recently found interest in it with this Alphabetic Order Activity. The ABC Order lesson also gives her time to work on fine motor skills and spatial awareness. We use a velcro board for arranging the words. I do help with these some if she needs it so we don’t take away from the primary goal- putting words in ABC order! First, gather your materials after printing and assembling the cards as instructed in the “Teach ABC Order Activity Plan: Word Set 1” downloadable PDF for 2nd grade or 3rd grade, as appropriate. The “Word Set 1” packet includes a flash card for each letter of the alphabet for students to organize according to only the first letter of the word. Some materials are optional depending on the student’s reading medium and fine motor skill level for manipulating flashcards and materials. I began by discussing the concept of sequence and alphabetical order with Madilyn. We talked about before and after, 1st 2nd and 3rd, as well as how we find the first letter of the word and must remember it. (Madilyn struggles with utilizing her working memory, so this hint helps.) We also sang the ABC Song together for a little musical fun! First, set up the materials on a desk in front of the student. Depending on the student’s abilities or preference, place the Group 1 Word cards to the side of the 1st 2nd 3rd Board, or on top of it. If you’re using velcro or magnets, it may be harder for some students with spatial awareness issues to understand the concept of when the words are in order and out of order. We found it worked best for Madilyn when we began the activity by placing the cards in a stack under the board. Set up each of the five groups of words using the flashcards giving one group to the student at a time. It worked best for Madilyn to read all three words, saying the words aloud after she read the last one. Then, I asked her to tell me which letter each word began with and say those aloud (letters only). Then I asked her which of the letters came first in the alphabet. With her response, I instructed her to find the flashcard that started with that letter and put it in the 1st location of the board (at the top). This is where she needed a little guidance to get the card in place. With some practice, she is already getting better at it! I then told her to tell me the remaining two words and the letters that began each of them. She would find the corresponding flashcard and put it in place. Once she had all three cards in place, I had her read them from 1st-3rd, in order. If she made a mistake, then we talked about what went wrong and corrected it before moving on to the next group of words. Madilyn has been practicing this activity daily and progressing each day (I know because I’ve been using the Data Tracking Sheets!). She has a better understanding of the alphabetical order concept and spatial skills. She is now putting the cards in their correct places on the board an average of 2 out of 3 times. Once the student has completed this lesson, he/she should move on to “Word Set 2” followed by “Word Set 3”. These sets help you teach ABC Order in which the second and third letters of the word must be considered.